Villa Maria Education Center was first opened in 1962 by the Bernardine Franciscan Sisters as a private, non-profit, tutorial and enrichment school for students in the Stamford area. In 1973, it was established as a full-time day school for children with learning disabilities. Since its humble beginnings, Villa Maria has grown from an after school and summer school program to become a highly reputed special education school, attracting students throughout Fairfield and Westchester Counties. On February 8, 1947, the Bernardine Franciscan Sisters purchased 15 acres of property from Edward Untermyer. On the property were a mansion and a carriage house once owned by Henry Miller, the playwright. The mansion was used by the Sisters as a retreat center, and as a provincial house, that is, seat of government for the Sisters. In June 1962, the four bedrooms, living room and kitchen in the carriage house were converted into classrooms where students came after school, and during the summer for tutoring. In time, the Sisters needed more space for their governing body and the number of children needing remedial services increased. Another two and a half acres of property were purchased, and in 1968, the school building and provincial house/convent for 40 Sisters was built. The Villa Maria Education Center continued as a private, non-profit, tutorial and enrichment summer school and after school program for students in the Stamford area. A number of students needed more services, and at the request and urgings of their parents, Villa Maria was established as a full-time day school in September 1973.Its purpose was to educate students in the basic subjects for grades 1 through 8 who were of average intelligence, emotionally sound, motivated to learn, but who failed to meet the demands of the curriculum to which they were assigned in their regular classroom. The school continued to service other students in the summer and after school. Since 1980, Villa Maria has been approved by the Connecticut State Department of Education as a school for children with learning disabilities. 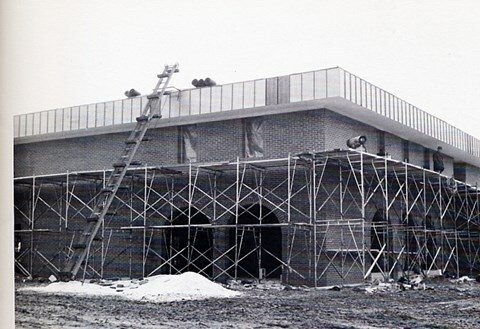 In 1984, an auditorium was added so students had a stage and place to perform; to conduct student council meetings; and to have physical education classes and play during inclement weather. In 1997, the combination of the cafeteria/art room was completed; the breezeway between the school and convent was enclosed; the convent library was converted into administration offices; and the provincial offices were converted into conference rooms and a faculty room. Renovations began in the fall of 2006 to convert 15 bedrooms on the second floor of the convent into junior high classrooms, 2 tutorial rooms, as well as offices for the school nurse, social worker, speech and language pathologist, accountant, and development director. The dedication for this wing took place on January 24, 2007.A kindergarten class was initiated in the fall of 2005, and the ninth grade was opened in the fall of 2007. Villa Maria’s multi-purpose room is transformed into a brand-new, championship-worthy gymnasium. The performing arts center is renovated. Significant enhancements are made to the conference room and library. Villa Maria is accredited by the Connecticut Association of Independent Schools and the State Board of Education. Junior high classrooms, two tutorial rooms, and offices for the school nurse, social worker, speech and language pathologist, accountant, and development director are opened. Villa Maria adds a ninth grade..
A new state of the art playground is built. A kindergarten class is added to our offering. A multifunctional media equipment center is opened. A new cafeteria/art room is completed, the convent library is converted into administration offices, and the provincial offices are converted into conference rooms and a faculty room. An 2,800 sq ft auditorium is added. Villa Maria is approved by the Connecticut State Department of Education as a school for children with learning disabilities. Villa Maria is established as a full-time day school for children with learning disabilities. The school building and provincial convent for 40 Sisters is built. The Villa Maria Education Center opens as an after school program. The Bernardine Franciscan Sisters purchase 15 acres of property in North Stamford.